More boats are manned by women, as captains and deckhands, at four local ferry companies. The ferry to Fire Island is manned by women. The crew of Fire Island Ferries Inc. is often composed entirely of female captains and deckhands, bucking expectations in a traditionally male-dominated industry. Women make up about a third of the ferry’s summer staff of 200 and, depending on how employee shifts work out, frequently run boats without any male crew members. All-female crews have become the norm at the ferry company in the past three to five years, said company president Tim Mooney, who is Morgan Mooney’s father. Capt. 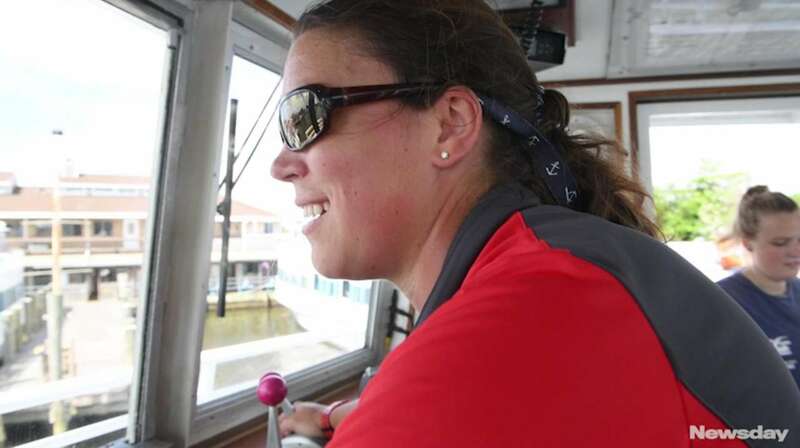 Morgan, as some call her, said she was the only full-time female captain when she began running boats eight years ago and only the third in the company’s 70-year history. Female crew members said that while they share a sense of camaraderie and pride with the other women, they’re no longer fazed by the demographics. But the makeup of the company’s five-member crews has surprised and delighted some representatives of international maritime organizations, who said they have not heard of any all-female ferry crews. Women are only an estimated 2 percent of the maritime industry, according to the London-based International Transport Workers’ Federation. Fire Island Ferries Inc. is not the only Long Island ferry company ahead of the curve. 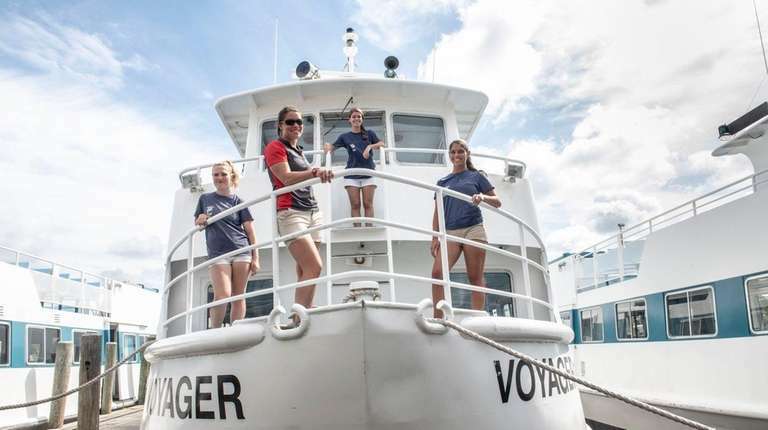 Davis Park Ferry, from Patchogue to Fire Island, Sayville Ferry and North Ferry, from Greenport to Shelter Island, often have all-female crews, depending on employee schedules, officials said. Kaitlyn Colgan, 20, a Fire Island Ferries Inc. deckhand, said she doesn’t understand why more companies do not have female crews. Women outnumber men working for the Patchogue-based company that has been in the same family since 1947, officials said. The company began using female crews decades ago for “Ladies Day” on Wednesdays, and more and more women have been joining the company. There are four female captains. Stephanie Sherman, who helps run Davis Park Ferry, said she believes she was the first female ferry captain on the Great South Bay in the 1980s. “It was daunting, and I had people giving me a hard time,” said Sherman, 64, of Patchogue. 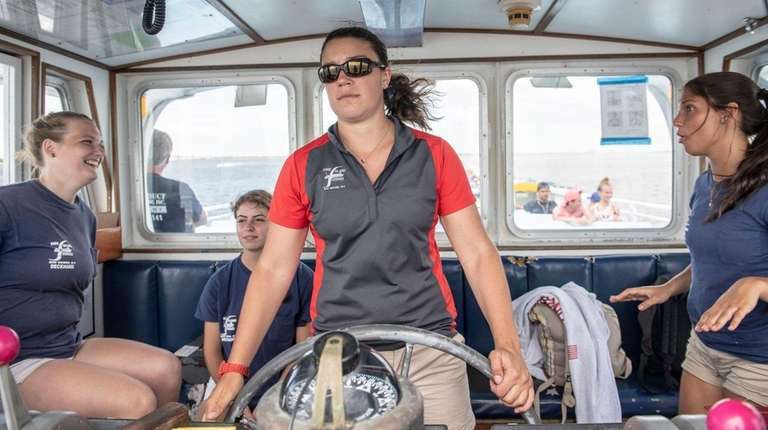 “It’s not actually surprising to me anymore” to see other female captains and crews, she added. The ferry company running between Greenport and Shelter Island Heights was incorporated in 1979 by a group of 125 Shelter Island homeowners. General manager Bridge Hunt said employees are a mix of men and women, but that with three people running the larger boat and two on the smaller boat, female crews happen “by the luck of the draw. I don’t give it a second thought. They’re all sailors,” Hunt said.